Introduction: Powell rods has been a well known fly manufacturer for decades, but in recent seasons the company's lineup of MAX bass rods have garnered plenty of attention from freshwater fishermen. We sit down with Keith Bryan the Owner and President of Powell rods to talk about what made the company what it is today and what is in store for the future for the fast growing rod manufacturer. Zander: Keith, thanks for spending some time with us today. Let's start at the very beginning. Please tell us about Powell, and the company�s history. 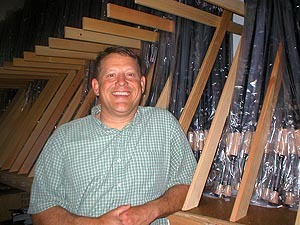 Keith Bryan: The company began in 1910 making and selling hand made bamboo fly rods hand made by E.C. Powell in Marysville, CA. His bamboo rods were unique due to the fact that their construction was semi-hollow for lightness. In fact, it was so cutting edge that he applied for and received a patent for that fly rod design. 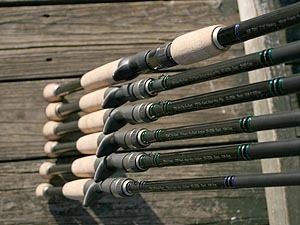 The company has always been known for high end fly rod quality craftsmanship and that reputation followed all the way through with the heritage and the progression of the company as it progressed through to the fiberglass era with E.C.�s son Walton Powell, then through to the graphite era with Walton�s son Preston Powell in Chico, CA. They always tried to address the needs of the fisherman. After many years as a small family business the Powell family made a decision to aggressively seek outside investment. This went on for a few years and finally, in or around late 1996 and 1997 the Powell family secured a partnership with a very successful businessman and avid outdoorsman who has a deep passion for fishing. He was able to bring a lot to the company, in terms of investment, manufacturing equipment, graphite, other materials, manpower, salaries, computer systems and much much more. In 1998 a new and much bigger state of the art facility was secured in Sacramento, CA. and the company moved. The company spent hundreds of thousands of dollars custom tailoring this facility to fit the needs to make rods and to have its own research and development facility. Once that was done the company hired two rod designers who had many years of rod design experience from other companies and a couple other individuals with vast knowledge within the industry. They had vast knowledge of how to make the right rod actions for today�s markets, in all markets, fly rods, bass rods, ocean rods, etc. We had a wealth of experience in rod design and development, we had numerous experienced rod makers and assemblers and we used good fisherman to test the rods that were being designed by us to ensure that these ideas would hold up under the toughest conditions they could put them through. I was one of the first new employees hired to sell the fly rods to dealers and there is where I began to learn about rod design and development and who the real heroes are behind the scenes of this very difficult discipline. I began to work very hard in understanding the rod design and development aspect to help me articulate to customers what set us apart from our competitors from a sales perspective. One of the key people brought in is a man named Woody Wood. He was brought into Powell in 1999 to help with rod design and development and to run the manufacturing part of the business. Woody now works in the industry as a territory manager for one of the finest sales rep groups in the U.S. and today is still a good friend of mine. As we began to work together in product development we began to make fly rods together and bass rods behind the scenes just using some of the same fly rod components and thread wraps and color schemes that Woody came up with, which ultimately we use today, that�s pretty cool. Eventually in late 2000 a man by the name of David Myers was hired to consult for Powell. David was brought in to develop high end, high performance fly and bass rods and was instrumental in the early success of the Fenwick rod company back in the day when Fenwick was without question the market leader. Dave developed the Tiboron Fly Rod series for Powell which was an instant winner and he was instrumental in the initial roll out of Powell manufacturing bass rod blanks as well. In fact, David Myers is the one who referred me to our current off shore manufacturer because he knew that this company who has been building high end bass and fly rods for nearly 35 years would fit the high quality and high performance product needs of Powell. Towards the end of 2001 David Myers had completed his consulting commitment and I was now running the company. I began making bass rods that a few fishermen were using and liking in fact, one fisherman even used these rods to win a big tournament in 2002. I felt that I had something going and just needed to relocate the company decided to move my manufacturing offshore and keep a little research and development facility up in Washington state, which we still work with today on some projects, and now we have a very nice distribution center to house our inventory and meet all of our customers needs. In the winter of 2002 I purchased Powell through a management buyout and began to move our manufacturing equipment to various locations, sell off the equipment we would never use and I moved the company closer to my home in Novato, CA. I was commuting to Rancho Cordova everyday and was tired of driving 95 miles one way everyday for two years. During 2001 to 2003 I actually came up with a full rod line under the name of another company and had some help of Dave Rush which I founded by the name of Perforce. Initially, I wasn�t going to use the Powell name because of the rich fly rod tradition, but in the end I ended up deciding to extend the brand into the bass fishing arena and used many of these rod model designs as the spring board into this market. I ended up using many of those blank design concepts, handle designs and thread color schemes that we developed at the Powell factory in Rancho Cordova with many improvements, with newer cutting edge materials for today�s market. I had some help from Gary Dobyns adding a few bass rods in the current product line but mainly, he helped us get into a few stores in the west and one or two stores out of state. 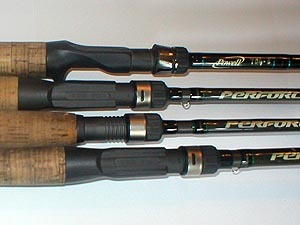 In 2005 Powell attended the ICAST show to launch the new bass rod line into the market. I then focused on selling and servicing the product in the west and nation wide. So far so good, but we have a long way to go because not all people even know us yet, but thankfully there are many that do, and I�m just thankful to be contributing and working in an industry that I love. Zander: Let's turn our attention to a normal day in the office, can you walk us through one? Keith Bryan: Not much has changed except I now have additional personnel to help me do the different jobs; therefore I assist many different departments during the day. A regular day at the office begins at home with a large cup of black coffee at 5:00 am. � I check my emails and I will communicate with our overseas customers to ensure that their business needs are met. � After the international calls from home I will communicate with our east coast dealers to ensure that we accomplish our combined business objectives. � I get to the office at 8:30am and begin to look over the completed shipping orders from the previous day. � Then I organize and prioritize all new orders that have been received from the day before and I continue to follow those as they are integrated into the process. � I prioritize all warranty claims that have been received and continue to follow those as they are integrated into the process. � I look at orders on hand and inventory on hand to ensure that we are on track to meet our goals and try and see where we might be deficient. � If the phone rings and everyone is busy, I pick it up and deal with different customer service scenarios trying to provide adequate answers to customer�s questions. Or sometimes it�s a dealer on the phone placing an order, and other times, there will be a new dealer inquiring about becoming a new retailer to sell Powell. � The phone rings again and if everyone is busy, I answer it to help out our customer service department as we are absorbing many phone calls on a daily basis plus, I always try to answer or have our customer service department answer the phone before it rings three times, that�s just the way I was trained from some great mentors that I learned from. � I talk with current dealers ensuring that we are doing a good job for them, or to see if they need anything, ask to see if there are areas that may need improvement, see if they have plenty of brochures, decals, etc. � I receive perhaps 10 phone calls a day and roughly that many emails from people who want to be on our pro staff, wanting to know what our requirements are to sponsor a fisherman. � I will assist the shipping department and help pull and ship orders as we are now in a state of shipping out new orders on a daily basis. � I work with our marketing people ensuring that our catalog and our website are going to be designed and ready for ICAST, and that�s a very big project right now. � I am constantly looking at new materials and new components staying current and always evaluating new opportunities. 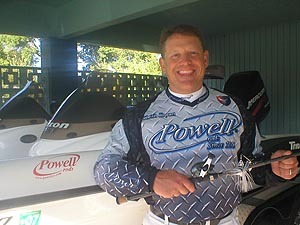 Zander: Who do you view as your primary competitors and what do you feel makes a Powell rod unique and special? Keith Bryan: You know, I look at us first. Because if I am taking care of the home front then I need not worry about what other companies are doing. Now, that�s not to say that I don�t look at all companies to see what�s happening in the industry because I do, but, I pretty much stay in touch with what�s happening and I do my own thing. I find that for me if we focus on our customers needs and listen to them plus a few key people that I surround myself with, we typically do what we need to do so our customers get the benefit. What I feel makes us unique and special is that we are able to utilize our proprietary lightweight �Maxumfiber� material which is an ultra high modulus light weight material which enables our rod design engineers to design rods that are very light, well balanced, quick dampening, while not compromising durability. Additionally, because of our combined large volume production in bass and fly rods we are able to lower our production costs and pass on that savings on to the end user which gives customers the finest high performance products our industry has to offer at great prices.